PFI was Government outsourcing at its worst as the Independent has uncovered. There is a saying “There are no free lunches” but politicians like to pretend that there are. PFI was a scheme to bring forward capital spending for hospitals, schools, care homes and others areas of under-funded public utilities without showing it in spending profiles – without being honest and transparent with the public about what it was doing. Ally this to the cozy relationship between certain politicians and those in the building and construction industry and the inability of civil servants to really understand enough about the risks to dissuade politicians and the recipe was in place. What we have is a burden on our public sector that will not impact the politicians that made the decisions but will have grave (in some cases literally) consequences for those who will be unable to be provided with the care they need as costs in our public sector rise over the next few decades as the bills are paid. Back in 1998, when I was a Trustee / Governor at a local school in North London, I identified that the school needed to be rebuilt. It was crumbling, had asbestos, its electrical wiring was unsafe, roofs were collapsing and let in vast amounts of rain water and the school had to make use of temporary facilities that were installed 30 years before. There was a real danger that the school would be closed at some time in the future unless radical steps were taken and the only answer was to rebuild. 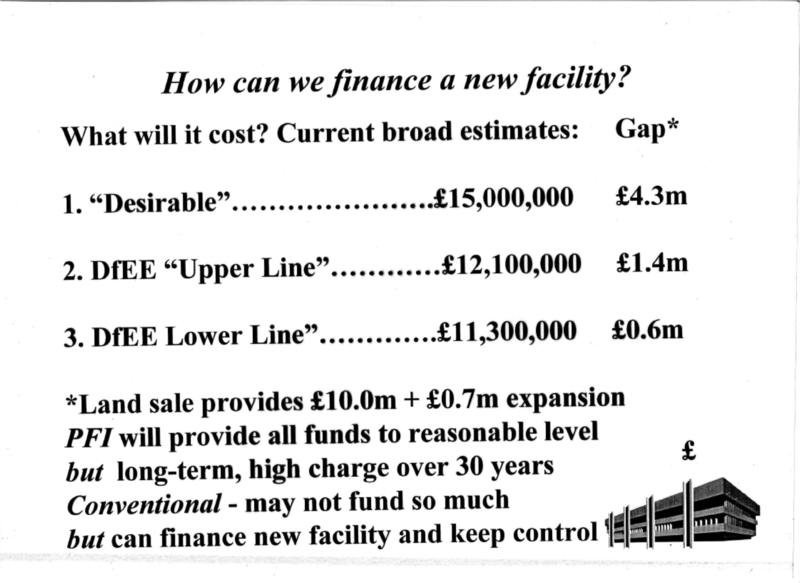 The school, now Ashmole Academy in Barnet was built without PFI – although it took until 2004 to see it through. Eleven years’ later, the school (where I was Chair for 12 years from 2002 until 2014) remains in excellent condition and is an excellent school – one of the best in England. When this Government began its enquiry into school buildings a few years’ ago, it commissioned Sebastian James and his team that produced the James Report. A procurement route established in 1995, and more widely adopted since 1997. It is an important route for much Government spending on assets as it transfers significant risks to the private sector. PFI requires private sector consortia to raise private finance to fund a project, which must involve investment in assets, and the long-term delivery of services to the public sector. As a result, PFI was allowed to continue on the basis that it meant to provide a “transfer of risks to the private sector”. For this transfer (which is really nonsense as the transfer was merely to get public sector spending off the books and into the books of the companies), the construction and service companies were handsomely compensated. Not only that, but local and national public sectors were completely overwhelmed by the prospect of architectural excellence rather than practical building and this resulted in grandiose schemes that impress architects and win awards but ended up being hard to maintain, costly to build and a long-term drain on finances. The lessor, now the School or the local authority is then stuck with a long-term agreement which it has to pay – at costs which are far greater than those which a Government could have loaned the money at – just to get costs off the books so no-one would notice that the financial burden was excessive while the new facilities were being built. As to the risk being transferred, at Ashmole, we decided to take on such risk and then make sure that we had good contractors, good architects, good project management overseen by knowledgeable Board directors / trustees and good contracts in place. The risk was normal – it was on the suppliers not the school as we were the customers. The risk issue is nonsense. The James Report is now forgotten but should have been a reminder that PFI was a major accident waiting to happen. The Independent’s Report highlights not just the crippling costs of PFI but also the problems that are met when government (local and national) become swept away by those in the private sector who promise a free lunch and by their own lack of transparency and inability to understand business. We entrust Government with much of our future but, while we condemn those that allowed PFI to take place in such a shambolic way, we should bear in mind that we may be expecting far too much in an area of greatest risk – the place where public and private sector meet. Knowledge and capability on either side are varied but neither really “gets” the other. This is why banking crises will always appear from time to time and why outsourcing of public sector often delivers much less than “expected”. The place where public and private sector meet is a dangerous one and is less well understood than the specific sectors themselves. However, one way that such disasters as PFI could be reduced is through transparency – it was the desire to keep costs “off the books” that took us into PFI when extra expenditure on the public sector financed by low-costs Treasuries would have been a far better investment. However, the pressure to falsely account was made by the pressure put on politicians by keeping government spending down even in the face of greatest need. It is why, even today, the NHS funding row is all about showing how the £8bn will be afforded in years to come when we all really know that we have very little idea what the UK’s finances will look like in three to five years. Good management of finances does not mean we can possibly be that accurate (no company really believes it knows how it will be doing beyond twelve months and beyond that, forecasts are but guides based on spreadsheets – the same is true of economies but with thousands more indeterminate variables). So, PFI and similar comes from our desire to lie to ourselves and for politicians to lie to a public that is implicit in the lie. We need to educate ourselves to reality by being more transparent. This entry was posted in Civil Society, Economics, Economics and Politics - unchanged from the 19th Century, Education, Finance, Politics and how we are governed and tagged Ashmole Academy, building, construction, education, false accounting, James Report, linkedin, NHS, off the books, PFI, Private financing initiative, public sector, schools, The Independent by Common Threads. Bookmark the permalink. I wonder if transactions made in the blockchain could have been made so opaque? If they’d been understood by all in the early days, if politicians had understood this, would PFI have happened? Is it not a consequence of opacity in transaction? Perhaps adoption of use of the blockchain as a principle is necessary to ensure transparency and would make it impossible to get away with concealed horrors like PFI. The scandal about PFI is more than just about risk transfer at the point of Financial Close, i.e. when the PFI deal was signed. It is also about, among other things, the fight that many, probably most, Public Bodies with PFI Contracts have on an ongoing basis to resist the attempts by PFI Companies, supposed ”Partners”, to identify gaps where risk can be effectively transferred back to the Public Sector client and about controlling changes and the often exhorbitant prices paid for many mundane day to day items. There is also often, unless the Public Body establishes a well educated and aggressive team, blatant fraud, overcharging for things the Public Body has often already paid for in the ”PFI Deal” and PFI Companies not doing what they are being paid to do. It is also a fact that many PFI Buildings have been built to a standard that is much lower than should be acceptable and which in some cases is actually a danger to the user. I have seen all of these issues at first hand including at least two major hospitals where fire protecion works had not been completed and in some cases was missing altogether. It is therefore not just about the Government deluding itself when trying to get this sort of expenditure ”off the books” it is also about the public being cheated into the bargain and put at risk. There is no PFI Contract that I know of that is operating as it should and very few that are getting the benefits anticipated and expected when the deal was struck. For example after the PFI Deal is enterred into the relevant Public body is a hostage to the PFI Company and its Service Sub-Contractors. It is also the case that the Public Body cannot make changes to the infrastructure, a key component in the ”hard sell” when things like ”flexibility” would have formed part of the PFI Investment Company’s proposals, and so is forced to go back to the PFI Company to ”negotiate” the cost of such changes. ”Negotiate” is a term used here loosely since the fact is that under such circumstances the Public Body has no opportunity to introduce competitive pricing since many if not all PFI Companies have an exclusivity deal for the term of the contract. In other words the Public Body has nowhere else to go. Changes to infrastructure also take an unacceptably long time to implement. For example I know from direct experience of one hospital that was given time limited funding to implement a crucial change. Under normal circumstances it could reasonably have been expected that the Trust involved would have been able to have implemented the urgent change withing 6 or so months. In the event the change took nearly 2 years and the deadline to spend the money had to be extended at least twice, much the the Trust’s embarrassment.